Last year, after DisplayLink released the first version of the supporting tools for their USB3 chipsets, I tried it out on my Dell S2340T. As I wanted a clean way to test new versions, I took Eric Nothen's RPMs, and updated them along with newer versions, automating the creation of 32- and 64-bit x86 versions. The RPM contains 3 parts, evdi, a GPLv2 kernel module that creates a virtual display, the LGPL library to access it, and a proprietary service which comes with "firmware" files. Eric's initial RPMs used the precompiled libevdi.so, and proprietary bits, compiling only the kernel module with dkms when needed. I changed this, compiling the library from the upstream repository, using the minimal amount of pre-compiled binaries. This package supports quite a few OEM devices, but does not work correctly with Wayland, so you'll need to disable Wayland support in /etc/gdm/custom.conf if you want it to work at the login screen, and without having to restart the displaylink.service systemd service after logging in. The source for the RPM are on GitHub. Simply clone and run make in the repository to create 32-bit and 64-bit RPMs. The proprietary parts are redistributable, so if somebody wants to host and maintain those RPMs, I'd be glad to pass this on. Quite some time ago, I was asked for a way to use the AV amplifier (which has a fair bunch of speakers connected to it) in our living-room that didn't require turning on the TV to choose a source. I decided to try and solve this problem myself, as an exercise rather than a cost saving measure (there are good-quality Bluetooth receivers available for between 15 and 20€). That's around 10€ in parts (cables always seem to be expensive), not including our salvaged Nutella jar, and the CHIP itself (9$ + shipping). You'll start by painting the whole of the jar, on the inside, with the acrylic paint. Allow a couple of days to dry, it'll be quite thick. So, the plan that went awry. 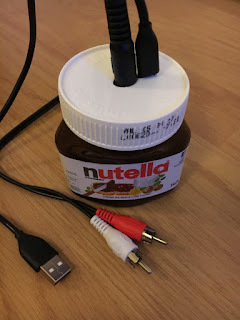 Turns out that the CHIP, with the cables plugged in, doesn't fit inside this 140g jar of Nutella. I also didn't make the holes exactly in the right place. The CHIP is tiny, but not small enough to rotate inside the jar without hitting the side, and the groove to screw the cap also have only one position. Anyway, I pierced two holes in the lid for the audio jack and the USB charging cable, stuffed the CHIP inside, and forced the lid on so it clipped on the jar's groove. After flashing the CHIP with Debian, I logged in, and launched a script which I put together to avoid either long how-tos, or errors when I tried to reproduce the setup after a firmware update and reset. The script for setting things up is in the CHIP-bluetooth-speaker repository. There are a few bugs due to drivers, and lack of integration, but this blog is the wrong place to track them, so check out the issues list. Apart from those driver problems, I found the integration between PulseAudio and BlueZ pretty impressive, though I wish there was a way for the speaker to reconnect to the phone I streamed from when turned on again, as Bluetooth speakers and headsets do, removing one step from playing back audio. I recently worked on creating an xdg-app bundle for GNOME Videos, aka Totem, so it would be built along with other GNOME applications, every night, and made available via the GNOME xdg-app repositories. However, I created a bundle that extends the freedesktop runtime, that contains gst-libav. We'll need to figure out a way to distribute it in a way that doesn't cause problems for US hosts. As we also have a recurring problem in Fedora with rpmfusion being out of date, and I sometimes need a third-party movie player to test things out, I put together an mpv manifest, which is the only MPlayer-like with a .desktop and a GUI when launched without any command-line arguments. Finally, I put together a RetroArch bundle for research into a future project, which uncovered the lack of joystick/joypad support in the xdg-app sandbox. Hopefully, those few manifests will be useful to other application developers wanting to distribute their applications themselves. There are some other bundles being worked on, and that can be used as examples, linked to in the Wiki. A little while ago, I was reading this article, called "Emoji: how do you get from U+1F355 to 🍕? ", which said, and I reluctantly quote: "[...] and I don’t know what Linux does, but it’s probably black and white and who cares [...]". Well. I care. And you probably do as well if your pizza slice above is black and white. So I set out to check on the status of Behdad Esfahbod (or just "Behdad" as we know him)'s patches to add colour font support to cairo, which he presented at GUADEC in Strasbourg Gothenburg. It adds support for the "bitmap in font" as Android does, and as freetype supports. It kind of worked, and Matthias Clasen reworked the patches a few times, completing the support. This is probably not the code that will be worked on and will land in cairo, but it's a good enough base for people interested in contributing to use. After that, we needed something to display using that feature. We ended up using the same font recommended in this article, the Emoji One font. There's still plenty to be done to support emojis, even after the cairo support is merged. 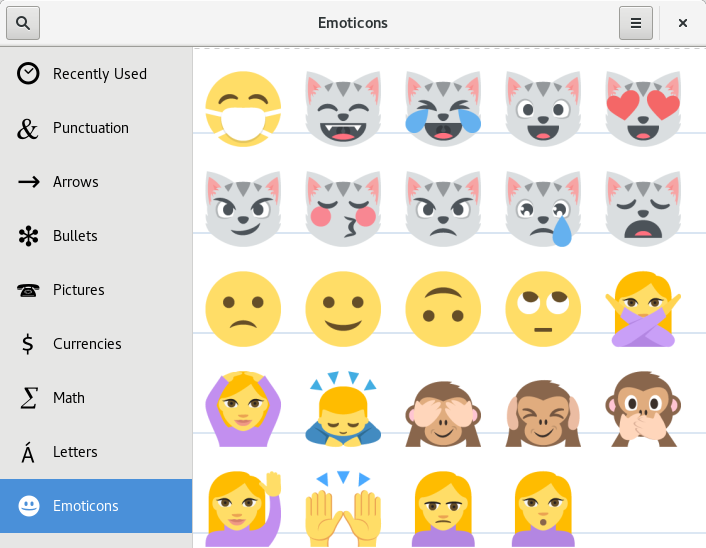 We'd need a way to input emojis (maybe Lalo Martins is listening), and support in a lot of toolkits other than GNOME (Firefox only supports the SVG-in-OTF format, WebKit, Chrome, LibreOffice don't seem to know about colour fonts either). 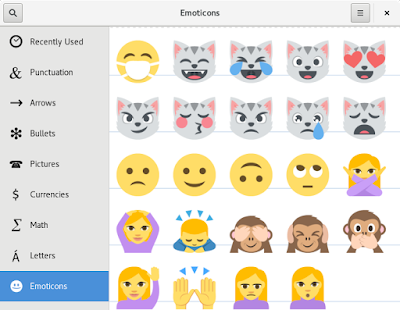 You can find more information about design interests in GNOME around Emoji on the Wiki. Update: Behdad's presentation was in Gothenburg, not Strasbourg. You can also see the video on YouTube.